just curious to know,some sport stunt kites have very straight leading edges and some have more curved leading edges! whats the difference between the two r.e flight Characteristics please ? which is the better shape r.e performance ? its amazing how sport stunt kites fly when you think about it isnt it? Over the years I've made the following observation on this. Disclaimer... I'm not an expert and I've never spoken to one about this (so I'm betting that smarter people know much more then I do, to the point it's probably obvious to most). I feel that curved edges allow the kite to make smoother turns. Kites with straight edges seem to make more "stiff" turns. I always thing of it that the kite makes a turn just like it's leading edge. If it's curved then the turn is nice ans smooth. If it's straight then the kite turns and locks on when you stop turning. Such a kite would be good for precision flying such as a ladder move or square turns. The "French Invasion" brought the straight leading edge to America with as much impact on Sport Kites as the "British Invasion" had on Rock and Roll. And in addition, with their use of tail weights and a high aspect ratio, pitch based tricks became popular and more accessible. That may be an over simplification, and there is still a lot to be said for for the curved, low aspect ratio kites. Stunt kite design questions peak my interest, and I just had to throw in my 2 cents. Since I am an old timer regarding Stunt Kites, I thought I would offer a little firsthand observations and experience on the history side of stunt kite development. Please note I am an old precision guy, so a lot of my contributions to stunt kite designs were directed to achieve a very controllable stunt kite that would fly on rails and respond as requested in our old time precision events. Now for a little history. In the late 1980s, stunt kites were large and loud, with straight leading edges and shallow sails. Eight foot wing spans were the norm for competitive stunt kites, and a lot of upper body strength was needed to hold onto and compete with these kites in moderate winds. Please note were didn't have the building materials that are available to us today. So we were using fiberglass tubes and heavy pultruded carbon frames with ripstop nylon sails. These kites were heavy as tanks! Light wind performance was a real problem. About this time, I threw my hat in the stunt kite design arena to see if I could design a better mouse trap. Since I primarily fly inland off of the coast, having a stunt kite for light winds was very important to me to refine my competition skills. So we found a practical engineering solution to silence the sail, which reduced the drag and increase the lifting potential of the sail. To do so, we added a leach line and gently curved the lower portion of the leading edge just enough to tension the sail and leach line. This allowed us to use the available building materials to fly in lower wind speeds. The attributes of this type of kite complimented the precision and ballet competition demands at that time. Others made their sails more efficient by adding more of a curved leading edge to tension their sails, without the use of a tensioned leach line. In aerodynamics, everything is a tradeoff and a balancing act. You don’t get something from nothing. The goal is to try and keep the flying attributes you like, without adding ones you don’t. With the addition of the leach line, we stopped the sail from naturally curving back. This removed the sail’s natural ability to washout at the tips preventing tip stall problems. So we created silent kites that would fly in lighter winds, but would tip stall as soon as you slowed the kite down. They turned great, but kept on turning and turning and turning… To cure this problem, we added additional standoffs at the end of the wing spars that provided a fixed amount of tip washout. Others increased the sail depth for the single standoff location. In higher winds these efficient sails make the kite fly much faster and pull even harder. The second set of standoffs helped control the forward speed, and were made longer for flying in higher winds. It became quite common to have many different line weights and lengths to control the forward speed of the kite. This evolution continued into the late 1990s, at which time slack line tricks became the driving force in stunt kite development. Some of the things we did to make our kites more efficient, were detrimental to slack line tricks. So as the type of fly requirements evolved, so did the designs to meet the flyers competitive needs. Stunt kites got noisy again and used straight leading edges again. They also became smaller. These changes with much deeper sails also drastically reduced the size of the wind window. So in a generalized summary after my long dissertation, stunt kite designers who want to achieve certain flight attributes will use a curved or straight leading edge, depending on what they are trying to achieve with their design. What has always interested me is finding a method to quantify the flying attributes of a kite, so one can compare these numbers, with numbers of other designs to see what makes them tick. In my review of some posts by stapp59, it appears he has the same curiosity. In the 1990s, I developed a program, Geokite, which is in a spreadsheet that reduces the attributes of a kite to a couple key numbers, which I then could use to compare and evaluate a variety of changes in the shape of a kite. It just took a ruler and the program to do this. 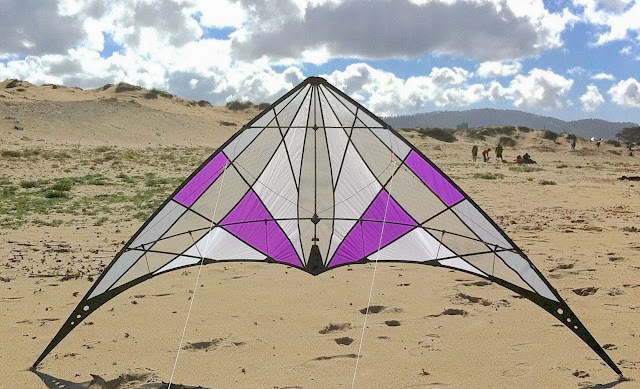 For our kiting community and on May 4, 2012, I posted a link to download my program under the Kite Building and Repair Section of this great Forum. Geokite took me many many hours to develop and refine, but it does a great job of reducing a design to key attributes. If you what to see what makes your kite tick, join a few of us on the dark side, download the program, measure your kites and compare your numbers. Please use my engineering and programing efforts to take your current designs to the next level. Ok, now I am done preaching. Have fun and enjoy! Doug thank you so much for the very interesting description of the history of the stunt kite designs. I'm also very interested in finding more about the relationships between the design and flight attributes of a kite. I downloaded your program and I wonder if you have a specific example applied to a dual line kite to better understand the program functionality. One of the links on the May 4, 2012 post with the program has another link for a version of the program populated with my last precision stunt kite design, I call the Bird of Prey. Yes, I like to recycle kite names between my stunt kites and single line kites. The Bird of Prey is a very solid 7 foot precision kite, which does some very nice simple slack line tricks and one heck of a flat axel. I designed the kite in 1999, but didn’t build it until a few years ago. I built a few of them for friends and family out of current high quality materials. Also, there is a link on that post where you can download my technical article on the engineering aspects behind the program. Please note that I have not embarked on exploring and updating the article for the current population of trick kites. Here is my suggestion. Once you get a handle on how the program works, measure a simple stunt kite you like, enter the information into the program, then make some minor adjustments to the shape of the kite to see how it changes things such as the overall panel aerodynamic center (center of area for one side of the kite), the aspect ratio, and in the three dimensional aspect of the design, the overall sail washout angle that is a measure of the depth of the sail. Please note that you are collecting three dimensional measurements of the kite when it is fully assembled. You also may want to read some of the questions and response on the series of posts. stapp59 observed certain minor changes on sails that were flat, which minor changes can be associated with a unique flying attribute of a kite. My program allows you to calculate several key numbers that can quantify these minor changes. Measuring several different kites will generate a window of key attributes that will allow someone to take a design to the next level, working on a side of the window that provides the key attributes your desire. What’s that old saying. You don’t know where you’re going until you know where you are. It’s just a tool to help us enjoy the design aspect of our hobby. thanks a bunch for all the great info on the leading edge designs!! Doug and Ian have both made significant contributions to the study of kite designs. Thanks for that guys! It is true you don't know where your going until you know where you've been so the study of the evolution of kite design is important. Lots of good info above from some very smart kite people! I think it's hard to separate curved leading edges from all the other design changes that have evolved over the last 12 years or so. It's really different era or epoch we're seeing when we compare a curvy kite to a modern kite with straighter LEs. The last generation of what I'll call curvy kites dates to between 1999 and 2002. 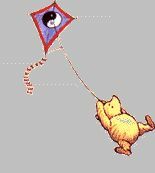 Two kites which come to mind which are good examples of the height of type are the Prism Prophecy and the Blue Moon Mamba. They both have curved LEs, but the also have three widely spaced standoffs which provide a very different sail shape than modern kites. Modern kites tend to have two standoffs fairly close together. In many ways the standoff placement and sail shape have as much to do with the way a kite flies as does the shape of the leading edge. The Mamba is probably the ultimate refinement in this era of kites. It has a higher aspect sail than the Proph (mainly due to the TE being trimmed away) and a somewhat straighter LE which makes for a narrower nose. This makes a kite which has a lot of the flight and trick characteristics of older designs with the ability to do more pitch based tricks. Just try to roll up a Proph! 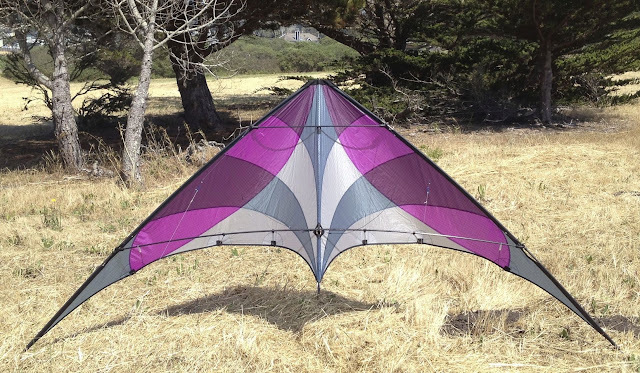 Going back to an earlier generation of Curved LE kites, circa '95, the Air Master Bad Boy (later PBSK) is a good example of really curvy design in sail outline, but with only one standoff and a fairly shallow sail more like previous more traditional stunt kites. 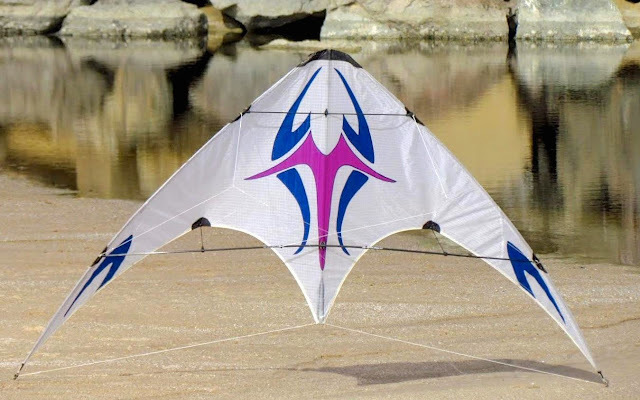 These kites have radically different flight characteristics compared to traditional straight LE kites like NSRs and Phantoms and are much farther from modern styles of flying than a kite like the Mamba. Stunningly beautiful - especially the Proph! Still need to find one of those Bad Boys for the classics bag. Thanks for the pics Allen. LEs have been gradually getting straighter for years, mostlly because a straighter LE gives you less sail area below the COG so they're easier to yoyo. i must say,look wise i like the curved leading edge but its good to know what the difference between the 2 are!